The Universe of FAITH is interconnected by the Labyrinth, a web of wormholes with hundreds of exits. Two powerful alien species fight a cold war for supremacy, while humanity and other minor species struggle to survive. The Gods are in continuous conflict with each other, but they can only affect reality through their believers . They will test your faith, luring you into heroic albeit sometimes suicidal missions in exchange for divine powers. 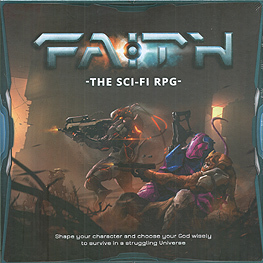 FAITH: the Sci-Fi RPG is a pen and paper RPG that uses board game elements to display information and keep track of it: The art is always on the table. The streamlined gameplay and wide variety of options are designed to make an immersive experience. Actions are resolved by playing cards, effectively allowing players to manage their luck and increase their chances of success.